Once the information that acts as a precursor for the Requirements has been analyzed and the Requirements have been created in Enterprise Architect they must be elaborated with properties and additional information to make them meaningful to the stakeholders who own them and the implementation teams that will use them to design and build the required system. When Requirements are created they will be given a name, but will often benefit from having additional information recorded about the requirement that will add clarification and details needed by the Stakeholders or the implantation team. These details can be entered into the 'Notes' field for the element. In addition there a number of built-in properties that can be set for each requirement, the most important of these are listed in this table; other user-defined properties can be added using Tagged Values. The Status is used to record the condition of the requirement; the modeler can select it from a drop-down list of predefined values. Setting the Status helps project managers and others involved in planning determine if a Requirement is ready to be included in a development Package of work or iteration. The Alias can be used to record a sequence number or identifier for the Requirement. A modeler can choose to display the Alias in a number of locations including diagrams and reports. 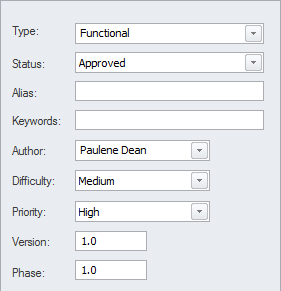 The Priority is used to set the precedence or relative importance of a Requirement and the modeler can select it from a drop-down list of predefined values. Setting the Priority helps project managers and others involved in planning to determine those Requirements that should take precedence over others for implementation. The Difficulty is a measure that attempts to describe the relative effort that would be required to realize the requirement in a system implementation. The modeler can select a value from a drop-down list of predefined values. Setting the Difficulty helps project managers and others involved in planning determine the effort needed to implement the Requirement. The Phase is a value that can be set to indicate the stage of development at which the Requirement will be implemented. The modeler can enter any value into this field. Setting the Phase helps project managers and others involved in planning determine which Package of work or iteration the Requirement should be included in.